Dragon seen in Bangor High Street! 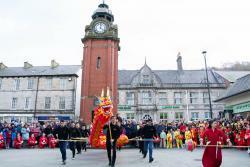 As part of Chinese New Year celebrations, the annual Dragon’s Parade was held in Bangor on Saturday. Hand made in China, the 14 meters long dragon, together with dancers, drummers and pupils from Our Lady’s RC School Bangor paraded from Bangor Cathedral along the High Street to the Town Clock before returning to the Cathedral. The parade was followed by the Chinese Gala Performance within the Cathedral where a variety of performances were staged, including Chinese songs and instrumental pieces, various Chinese traditional dancing and a performance by the Bangor Taekwondo group. The Chinese New Year celebrations were organised again this year by the Confucius Institute at Bangor University. The Institute was established in 2012 and offers a programme of activities and courses designed to provide staff, students and the wider community in North Wales with an understanding of Chinese language and culture, as well as promoting the culture, language and heritage of Wales to the people of China. This year, Chinese New Year (or the Spring Festival) officially began on February 5th and will end on February 19th with the Lantern Festival.